against journalists. In 2014, it said, two-thirds of the journalists killed were in war zones. But in 2015, it was the exact opposite: "Two-thirds were killed in countries 'at peace'." "The creation of a specific mechanism for enforcing international law on the protection of journalists is absolutely essential," RSF Secretary General Christophe Deloire said. "Non-state groups perpetrate targeted atrocities while too many governments do not comply with their obligations under international law." "The 110 journalists killed this year need a response that matches the emergency. A special representative of the United Nations secretary-general for the safety of journalists must be appointed without delay." The 67 deaths bring to 787 the total number of journalists who were murdered, knowingly targeted or killed in the course of their work since 2005, the Paris-based organisation said. In 2014, there were 66 such fatalities. War-torn Iraq and Syria were the most dangerous places in the world this year for journalists, with 11 and 10 fatalities respectively, the RSF report found. 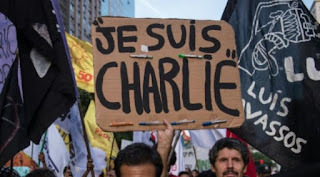 Third on the list was France, where eight journalists were killed a jihadist assault in January on the offices of the satirical magazine Charlie Hebdo in an assault that shocked the world. "It was an unprecedented tragedy," RSF said. "A western country had never suffered a massacre of this kind in the past. "Charlie Hebdo's journalists and employees have been living under close protection ever since. Some of them still have to keep changing their place of residence." In Syria, the northern town of Aleppo was described as "a minefield" for professional and citizen-journalists alike. "Caught between the various parties to the conflict since 2011, journalists are liable to end up as collateral victims, being taken hostage by a non-state group (such as Islamic State, the Al Nusra Front or the Free Syrian Army) or being arrested by the Assad regime," RSF said. Those murdered in Syria included Japanese freelance reporter Kenji Goto, whose execution by the Islamic State group was unveiled in a macabre video in January. - India 'deadliest' Asian country - The RSF report also singled out India, where nine journalists had been murdered since the start of 2015, some of them for reporting on organised crime and its links with politicians and others for covering illegal mining. India saw five journalists killed in the course of their work and four for uncertain reasons, which is why it ranked below France where the cause of death was known. "Their deaths confirm India's position as Asia's deadliest country for media personnel, ahead of both Pakistan and Afghanistan," RSF said, urging the Indian government to establish "a national plan for protecting journalists". In Bangladesh, four secularist bloggers were killed in acts claimed by local jihadists. "The passivity of the Bangladeshi authorities in the face of this bloodbath has fostered a climate of impunity that is extremely dangerous for citizen journalists," RSF said. The report also placed the spotlight on 54 journalists who were held hostage at the end of 2015, 26 of them in Syria, and 153 journalists who were in prison, 23 of them in China and 22 in Egypt. non-professional "citizen-journalists" and seven other media workers were also killed. The high toll is "largely attributable to deliberate violence against journalists" and demonstrates the failure of initiatives to protect media personnel, the report said, calling for the United Nations to take action. In particular, the report shed light on the growing role of "non-state groups"